This image, one of the first likenesses of George Washington to circulate in Europe, catered to the French fascination with the much-lauded American general. The model for the engraving was a painting by Charles Wilson Peale owned by the Marquis de Lafayette. Later states of the print corrected the spelling of the General's name. 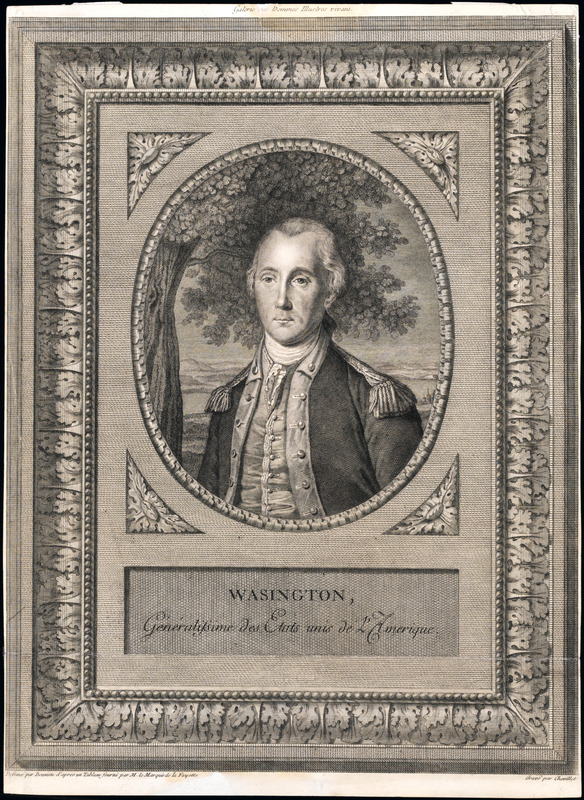 Bust length oval portrait of Washington within an elaborate rectangular frame. Washington has his head turned and looks to the viewer's left. He is dressed in military uniform. Behind him is a landscape with a river and mountains. A tree frames the left side of the view and a small town is visible over his right shoulder. Four pendentives with foliage are set around the oval. A plaque below the oval reads "Wasington/Generalissime des Etats unis de l'Amerique" [Washington/ Commanding General of the United States of America]. A trompe l'oeil rectangular frame with beaded internal border and convex outer border of oak leaves surrounds the whole. Centered above the frame the title "Galerie des Hommes Illustres Vivans" [Gallery of Famous Living Men] is printed. At the lower right is noted "Dessine par Bounieu d'apres un tableau fourni par M. le Marquis de la Fayette" [Designed by Bounieu after a picture provided by the Marquis de la Fayette]. At the lower left is noted: Grave par Chevillet" [Engraved by Chevillet]. Mount Vernon's object research is ongoing and information about this object is subject to change. For information on image use and reproductions, click here.